Since Dr. Raymond Moody broke ground in the 1970’s with Life After Life, books on NDE (near death experience) have created their own genre. The authors have faced ridicule, skepticism, been discounted as crackpots or praised for their bravery. Most have not been educated enough or sophisticated enough to merit national exposure. This year the NDE took a leap of credibility with the publication of two books written by medical doctors. Mary C. Neal, an orthopedic surgeon, made the television rounds with To Heaven and Back, an account of her drowning in a kayaking accident and subsequent heavenly experience. 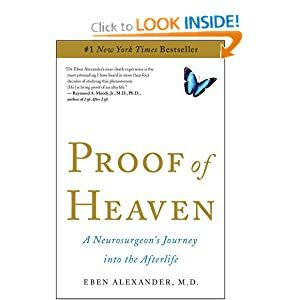 But it’s been Dr. Eben Alexander who hit the mother lode with an Oprah interview about his story, Proof of Heaven: A Neurosurgeon’s Journey into the Afterlife. This is a book that will be perceived very differently by readers, depending upon where they are in their spiritual journey. For those of us who need no proof of heaven and have read many books on the topic, it isn’t the most compelling NDE book around. For others who find this new territory, it may be a powerful story, hard to dismiss. Harvard Medical School’s Dr. Eben Alexander is certainly a highly credible source for an incredible tale. One day a bacterial E. coli infection quickly overtakes the respected neurosurgeon’s system and fills his brain with pus. He spends seven days in a coma and, by all medical precedent, should die or at best be left in a vegetative state. Instead, he makes a full recovery with an amazing memory of an afterlife. Whether you’re already a true believer or a doubting Thomas, Proof of Heaven is a miraculous tale of against-the-odds survival and a peek at an unearthly realm of heavenly promise.